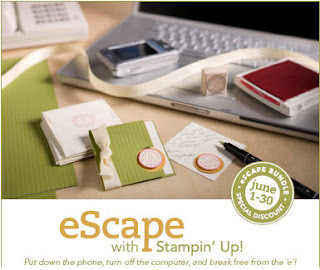 Designs by Lisa Somerville: eScape with Stampin' Up! Join Stampin' Up! during the entire month of June in breaking free from the 'e'! Stampin' Up! has designated June 25, 2008 as eScape day--a day to put away your cell phones and laptops and focus on reconnecting with your "wireless network." Throughout all of June, you can purchase the eScape Bundle with products at 25 percent off. 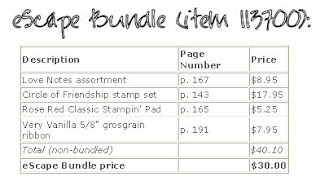 Email me today to purchase your eScape Bundle!